I Thought I was a Smith: Was it all about Louisa? Just because I can't find any record of wrongdoing by George Cockram aka Thomas Smith, that doesn't mean he didn't do any! I may sound like I WANT to find out he was a cad and a bounder, but really, I don't - this is my great-grandfather I'm talking about, and although I never met him, I've grown quite fond of him while I've been trying to piece his life together. No, I don't wish for devillment, I just wish for answers. Thankfully, I'm not alone in this quest. My cousin Donna has been asking questions about George for much longer than I have, and she has one or two interesting theories about him. 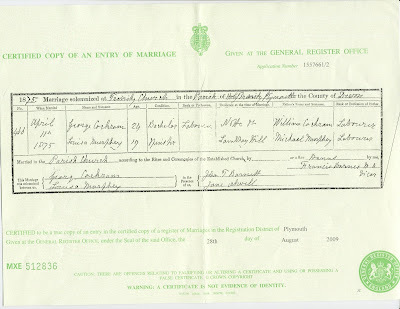 First, she thinks perhaps George really was in the Royal Marines - he could have joined when he was 15 years old in 1866, and he would have had to sign on for five years, so he would have been discharged in 1871, perhaps just at the time the census was being taken. If he was at a loose end accommodation-wise just then, it's possible that he could have slipped through the net, and that's why we can't find him in that census. And perhaps it was his time in the Royal Marines that gave George the wanderlust that eventually took him to Canada. UPDATE: I've just discovered that IF George was in the Marines, the reason I can't find any records for him is that the Royal Marines' Service Records available at the UK National Archives were originally created in 1884 but include records created retrospectively for anyone who had joined earlier and was still serving in 1884. George was long gone by then - so there is a real possibility that he was in the Royal Marines. Whether he was ever in the Marines or not, his 1875 marriage record tells us that at some point George took up residence in Notte St in Plymouth, which is the same street where Louisa and her mother lived in 1871, and may even have been the same lodging house. Perhaps that's where he and Louisa met. Maybe George worked in Plymouth's main industry, shipbuilding, or he may have been a labourer on the docks, loading and unloading ships' cargo. Living and working in a seaport, it seems likely to me that he might have met men who had been to Canada, and who spurred his desire to go. 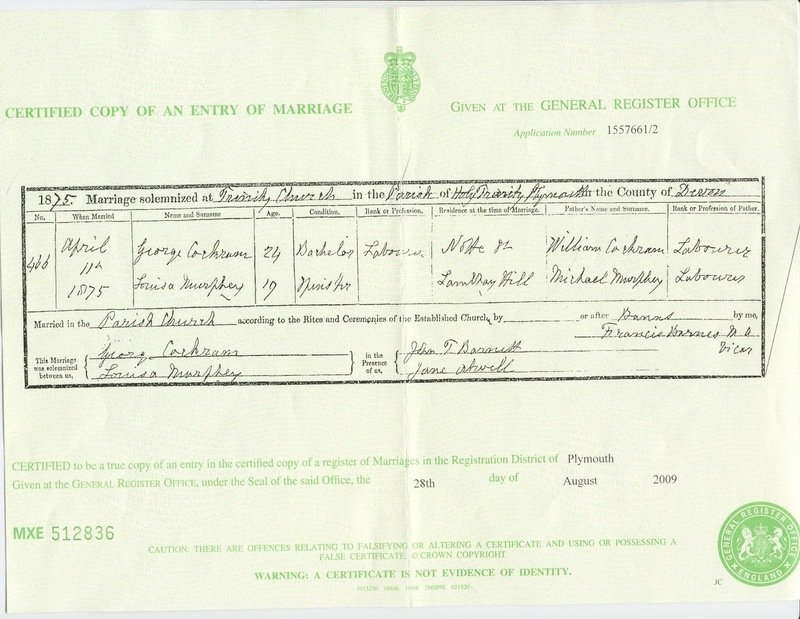 George and Louisa's marriage certificate, showing George living in Notte St and Louisa in Lambhay Hill. Note the name of one of the witnesses - Jane Atwell (at least I think it says Atwell) - this might be Louisa's sister, who as I mentioned earlier, disappeared off the radar. So far I haven't found a Jane Tremayne/Murphy who married someone called Atwell, but I'm still looking - if she has living descendants, one of them might hold the key to the Cockram/Smith mysteries. Second, Donna wonders if George and Louisa were running from Louisa's father, Michael Murphy, or someone else in his family. 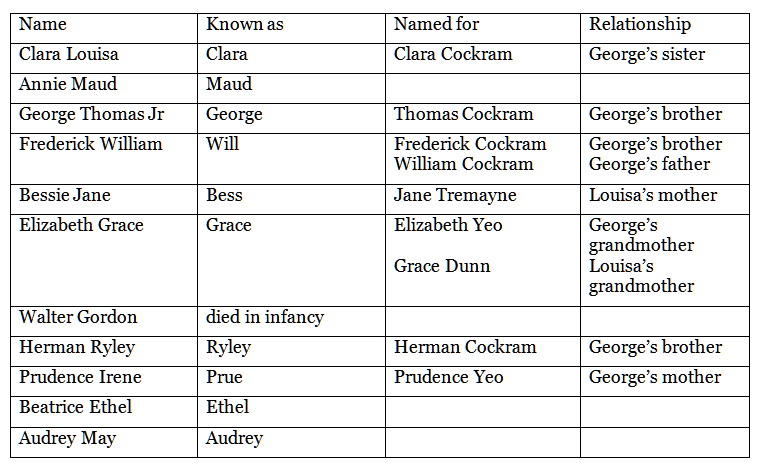 We know virtually nothing about them, unfortunately, so this is mere speculation, as is another idea - that Louisa's first child, Clara, was not George's - her real father was someone nasty that Louisa had been entangled with, and she wanted to get away from him, and make sure he couldn't find her or the baby. Either of these ideas could explain why George changed his name - it wasn't him who needed to 'hide', but Louisa! Of course she had already changed her name when she married, but a second change would hide her from people who knew her married name. I like the way Donna thinks. If anything is ever going to lead us to the truth of the matter, it will be ideas like these, I'm sure. Whatever it was that led them to leave England and change their names, Donna thinks that George and Louisa didn't leave home without some regret, or at least a need to keep some kind of link with their former lives. This thought comes from the fact that so many of their children's names can be traced back to specific people in their families. 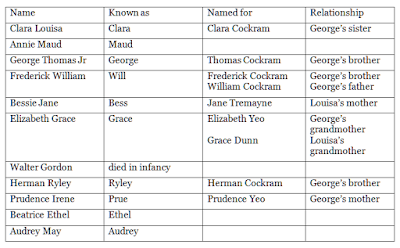 Consider this - of their eleven children, at least seven had first and/or middle names that came from close family members. Some of the untraced names here may have come from the Murphy family, but we have no idea who they were. My grandfather's name, Ryley, is the most intriguing of them. Surely there's an Irish connection there... Should I be searching for a Ryley Murphy who had a son or a brother called Michael? Oh god, there's another thing to put on my 'to do' list.